Our athletes are all inspirational for very different reasons. Some are striving for excellence despite obstacles that are appearing in their way and some are really reaching for the stars in terms of achievements, smashing records and competitions left, right and centre, but they all have one thing in common; They make being super human look like a doddle. When I was born way, way back in 1969, my parents were told I would never be able to walk. I was born with a condition that perplexed the doctors but was eventually diagnosed as a more uncommon form of Dwarfism called Diastrophic Dystrophy. I had very malformed and twisted legs, club feet that turned inwards and a double scoliosis of the spine. As an adult I stand a very tall 3 feet 8 inches. Each summer holiday I would undergo surgery to both legs and feet up till the age of 17 but at least I could walk a little although I have always relied on a wheelchair for distances. My parents and sister do not have the condition and brought me up as any other child encouraging me to try anything and learn my own limitations. This gave me a great grounding for an independent life later on. I first encountered problems in society when I was transitioning from primary to secondary school. This was before the Disability Discrimination Act and the Education Authority wanted to place me in a ‘special school’ . I was intellectually very bright so my parents (my dad was a coal miner) saved hard and I worked hard to pass the exams to private school. Age 13 I went to Boarding School where I truly learned to be independent and fend for myself. I gained 9 O levels and 4 A levels. It was here at here age of 16 I started to learn to drive. At 17, with both legs in plaster cast following surgery, I went for my driving test much to the horror of the examiner. Roles were reversed and I assured him everything was fine. I passed first time and this new independence changed my life forever. After University I set a career path in public service. I worked as a Civil Servant before moving to Local Government where I specialised in Rural and accessible Transport Solutions winning numerous awards for my innovative projects some of which are still running some 18 years later! I then took a senior role as the principal officer managing the department that looks after the entire transport network for the city of York but my life was about to change dramatically. In 2004 my left knee collapsed and I was told that I would have to have my leg amputated. I was fiercely protective of the little mobility that I had and spent 2 years finding a surgeon to help. I met one who was working on techniques to save injured soldiers’ legs returning from war and he agreed to try it on me. It involved replacing the hip, femur and knee (a total femoral replacement). I had my left leg done over 2 surgeries but then my right knee collapsed and had to have the other leg done soon after. 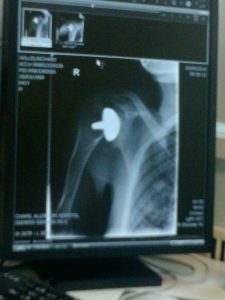 Arthritis was taking my joints and before long had to have my right shoulder and left ankle replaced too. This meant I had to take early retirement on medical grounds. It was during this near decade of surgeries my wife and I decided to start a family before it was too late. 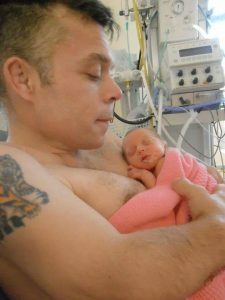 Our daughter Cherry was born in 2011 9 weeks early! Luckily she was strong and had no health problems at all. I was blessed to be able to be at home as she grew. 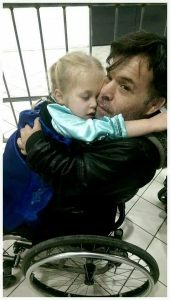 As she started to crawl, I would be learning to walk following surgeries and as she learned to walk, I was learning to walk again, we formed a very special bond. It was this bond that got me into power-lifting. We were watching the Paralympics in 2016 and Cherry saw a lady with dwarfism doing bench press. 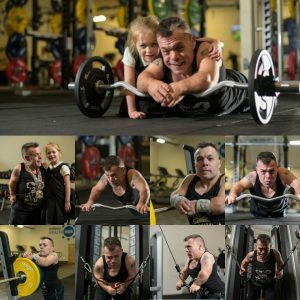 She recognised that the lady was small like me and said “If that small lady can lift heavy weights, could you too daddy?” And that was such powerful motivation to do something new and challenging after years of pain and surgery and to do something to make my daughter proud. Within a week I had found someone to coach me and began training …hard. 2017 was my first year competing. Not only was I competing as a disabled athlete but I was also invited to compete in an able bodied federation against power lifters literally twice my size and more. 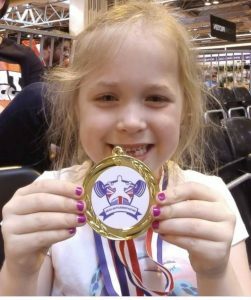 I set a new Master 2 British bench press Record in May 2017 with a lift of 90kg (body-weight 53kg). I then was invited to the British Championship in September where I became British Master 2 champion with a lift of 95kg. I was invited to represent Great Britain at the AWPC World Championship in November 2017 in Moscow. I crowd funded the costs. I won the masters 2 World Title with a lift of 97.5kg and set a new world record. 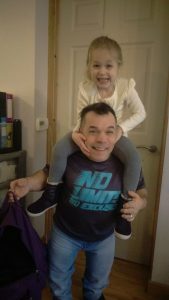 2018 has gone even better, Still highly driven and motivated despite separating from my wife in May and now bringing up my daughter on my own I set a new world record in January with a lift of 102.5kg. 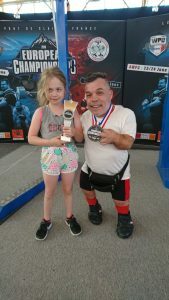 At the British Championship in May 2018 at the NEC Birmingham I took the British Title again with a lift of 105kg, my daughter was sooooo proud..she comes with me to all my competitions so it was a huge adventure for her to come with me to France for the European Championship in June 2018. I made it a real experience for her, flying to Amsterdam then to Geneva and getting a coach through the Alps to Grenoble. I took the European Masters and Open title and set a new world record of 110kg at a body-weight of just 49kg. 2018 finished with us travelling to Manchester for the AWPC world championship. I took the world title for the second year and set a new world record with a lift of 115kg. So what’s next? I’m currently in the middle of my off season training and getting stronger still despite a few medical issues with my legs. I am testing myself in competition in January aiming for a world record attempt ..I intend to lift over 120kg. Then onto the British, European (Ireland) and World championship (Orlando) I hope to be able to qualify for the Paralympics 2020 dependent on leg issues but will be focusing more on the Commonwealth Games in 2022. Ultimate aim…triple body-weight lift of 150kg…it WILL be done!!! !